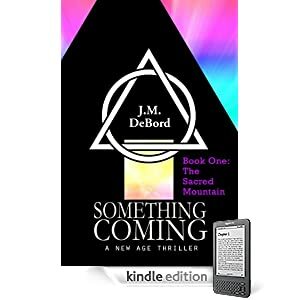 For the price of an extra large soft drink, Kindle readers can own an original and well-reviewed novel about a Second Coming unlike anything imagined. Extra care was taken to convert the novel and its thrilling sequel to Kindle format, so buyers get the same high-quality as the print edition of this original supernatural thriller. In Something Coming, King Antiochus Epiphanes lives again, with the help of his reincarnated queen and his followers. He brings peace, signs and wonders, but is hated by fundamentalist for his persecution of Israel long ago that sparked the Maccabean Rebellion. Will his second coming fulfill the prophecies of a coming New Age of enlightenment, or is he the Antichrist out to finish what he started? Click on the cover to go directly to Amazon and get this novel! Took 11 years to write and publish, with every chapter rewritten at least ten times, sometimes 20 or more, until as perfect as I could make it. Yes, I’m a perfectionist, and no doubt a mistake or two slipped in, but I guarantee you’ll get your money’s worth. For some readers, it’s the bargain of the year!